Hurray for 3 years of London BJJ Women’s Open Mats! That’s right, we just closed down 3 years of women coming together to get their BJJ on. Our most recent event was hosted by the ladies of Nova Forca, Rebekka Francis and Anthea McCourtie, and sponsored by Lutadora; Lutadora provided fruit and flapjacks and shot a short ‘montage’ film to be released shortly! 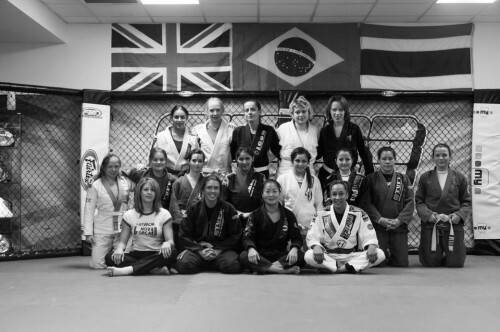 As ever, the Open Mat rocked a brilliant atmosphere with 16 women on the mats. Experience ranged from white and blue belts up to black belt, Esther Tang, and brown belt Yasmine Wilson. Sparring was preceded by a warm up and technique led by Esther. International flavour was added with a Danish visitor and the Open Mat provided an opportunity for fun reunions for some of the women who attended camps in Denmark and Netherlands over the past year. Stay tuned! Plans are already in motion for the first event in 2013, which will be announced shortly.